This may be the perfect opportunity to get that new car that you have been dreaming about. 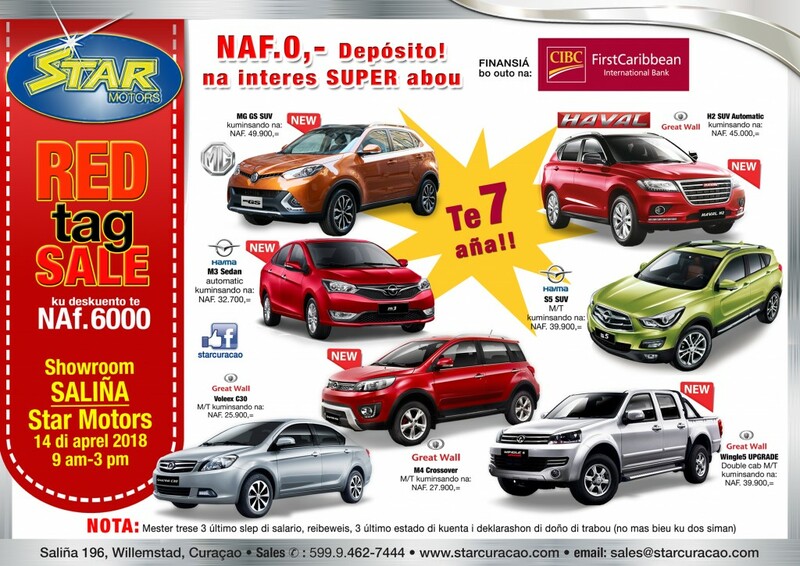 WILLEMSTAD - The Star Motors and CIBC FirstCaribbean have partnered for the very first-time to offer Curaçao their first Red Tag Car Sale. This event will offer patrons the opportunity to choose the car that fits their lifestyle out of the many brands and models offered by Star Motors, be it an MG, Haval Great Wall or Haima. Representatives of CIBC FirstCaribbean will be on hand to offer attractive auto financing packages with the possibility of zero down payment, special interest rates with up to seven (7) years to repay. Come take a test drive and talk to the sales specialist of CIBC FirstCaribbean about financing your dream car. The rest of 2018 can be exciting if you could enjoy it in one of the many brands and models showcased by Star Motors and all offered at affordable prices with an additional reduction of up to Nafl. 6.000. Star Motors offers a wide selection of cars including the MG GS SUV, Haval Great Wall H2 SUV, Haima M3 Sedan, Great Wall Volleex C30, Great Wall M4 Crossover or a Great Wall Wingle5 UPGRADE. The Red Tag Car Sale takes place at the showroom of Star Motors in Salina between 9.00 AM and 3.00 PM. Don’t miss out on this event. Let it be the start of an unforgettable rest of 2018 for you and your family.